Over my career, I’ve had a series of jobs that, in all candor, have become increasingly boring. Once upon a time, I was a college crew coach, and then a police officer, and then the founder of an internet startup which offered professional photography for sports. At this point in my life, I’m much less interested in telling a compelling story, and much more focused on building a successful business. Which is why boring markets are attractive. intrinsically uninteresting: in no way do they capture the imagination of the greater population, no matter how many times — or how well — you tell the story. highly technical: the level of expertise required to build valuable software solutions in these markets is hard to acquire. poorly served by current solutions: much of the software in these markets was made by insiders, i.e. created by those within the industry who recognized a problem and solved it with a point solution product. The combination of an easily-relatable product story and a broad market is seductive, and it is guaranteed to attract a crowd of seasoned, talented software developers (top, right quadrant). For intrinsically interesting markets, even the smallest niches of markets are addressed by smaller startups and entrepreneurs (bottom, right). Meanwhile, industry insiders serve highly technical, niche markets with point solutions; these products lack both polish and product vision and are unable to serve broader markets effectively (bottom, left). 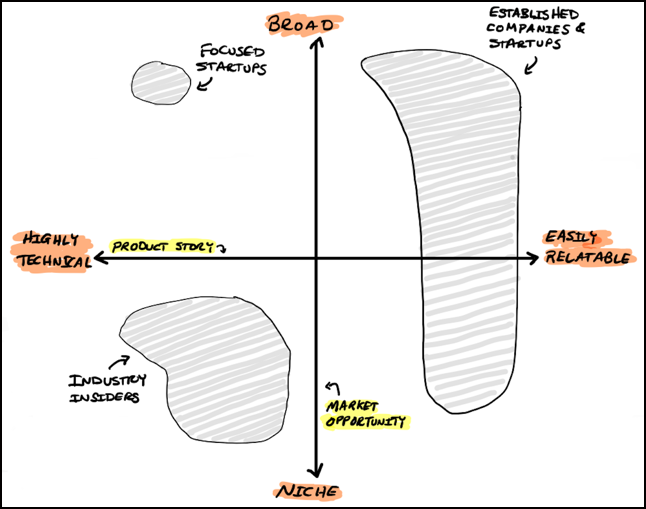 Which leaves the top left corner for a focused startup. The price of admission for an industry outsider is high — get ready to roll up your sleeves and expend considerable time, energy, and focus to create a broadly appealing product. Once you’re there, though, you’re rewarded by not only less competition, but you’ll also have a valuable product to present to an identifiable, under-served customer base. Insurance as an industry is garnering unprecedented investment: the level has grown from $740 million in 2014 to $2.6 billion in 2015, and the community has coined a term to describe investment in Insurance technology: InsureTech. Incidentally, most of the buzz on InsureTech centers on the sexiest (and most easily relatable) business ideas — using drones and telematics data for better underwriting, social media platforms to improve marketing, on-demand models for very short term policies (airbnb rentals, Uber rides), re-imagining the customer acquisition process through tablets and smart phones. 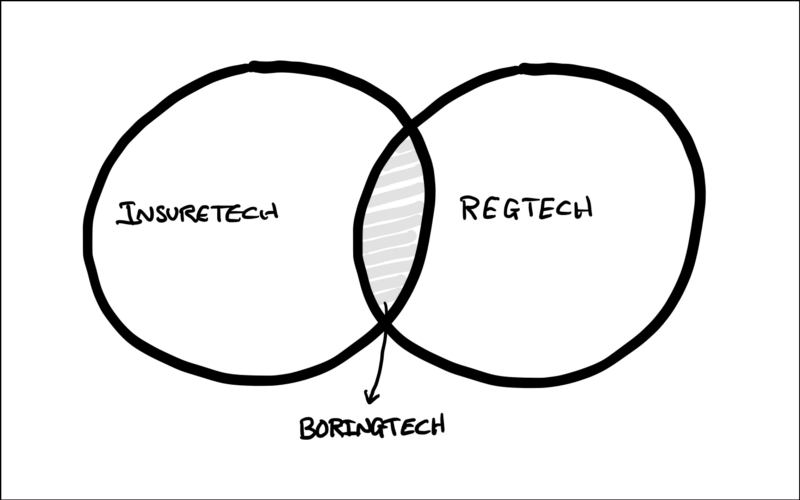 Separately, there is also a nascent (but growing) area of venture focus on companies that address the business challenges of regulatory reporting — this area as been termed RegTech. And I’m surprised you’re still reading.